Attention soccer Moms! Need help creating a super cute Soccer layout using the element you already have? We've got you covered! Customize your layout using your team's colors! Customize the soccer jersey with your child's number! This project as pictured can be made on 12x12 and 24x12 sized mats! The large soccer ball and playing field will not cut on a 12x6 mat at the specified dimensions. 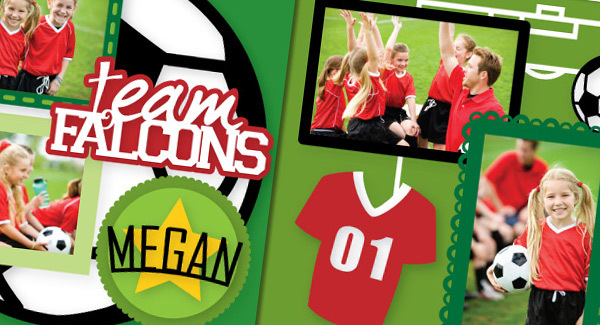 We created a "Team Falcons" for our pages, but you'll use your own team name or logo in place of ours (not included). 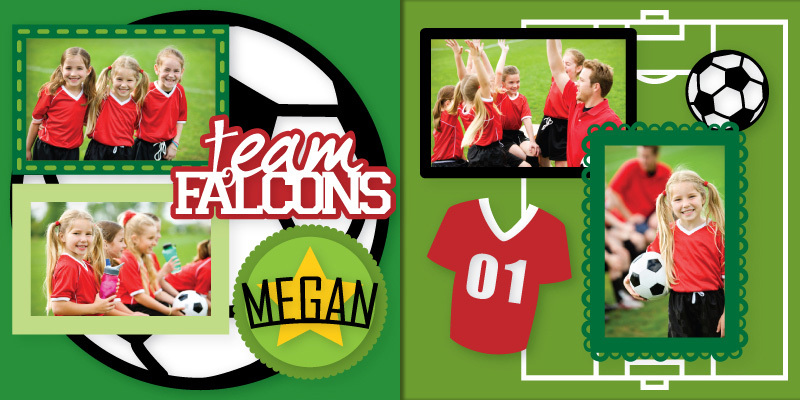 Then add your player's name in place of our little Megan's and you've got a winner! We used five different shades of green papers. We're referring to them as "Green 1," Green 2," etc. through "Green 5" with 1 being the lightest and 5 being the darkest. For the background papers we used a 12" x 12" piece of Green 4 and a 12" x 12" piece of Green 3. Each SVG Collection required to create this layout is listed below. Clicking on the name of each collection will take you to our store where you can purchase the necessary files! How did you create your team name? I love this!